Title: Oprah Winfrey and "Friends" Will Teach New Age Course Called "Reflections on the New Age Christ"
Subtitle: Guest column from Warren Smith reveals that Oprah Winfrey is dramatically advancing the cause of the appearance of the New Age Christ (Antichrist). Long a New Age advocate, Oprah is now "pulling out all the stops" in her promotion of Antichrist and his doctrines. Beginning January 1, 2008, I will be teaching A Course in Miracles daily on Oprah & Friends XM 156. For one year, we will go through the entire Course. If this is of interest to you, get your XM ready, take your Course off the shelf or order a copy. We're going to do the Course, and stay the course! 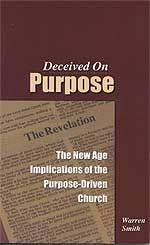 Shortly after the posting of Smith's article and the two subsequent articles on Herescope, there was considerable concern - at least in Christian circles - that Oprah was using her radio program to teach this New Age Course. Many Internet sources cited what was happening. Amidst the uproar, Marianne Williamson's "Big News!" announcement suddenly disappeared from her website. All attempts to get information on why Williamson withdrew her announcement were to no avail. I am talking to Esther Hicks here, who is, I am saying today, the secret behind The Secret because she . . . is a big, big, big part, she and her husband Jerry, of the creation of the DVD that Rhonda Byrne did. . . . But she is here in our studio and I am going to ask you to channel Abraham, and let me just say, the reason why I wanted you to do this on the radio is because the television audience isn't ready for it. . . . This radio interview, posted on the dedicated New Age Spiritual Inspiration.info website, is really difficult to listen to because it involves occult channeling, so the listener should beware. Sadly, one quickly realizes the depth of Oprah's New Age beliefs when listening to this interview. And the reader of Herescope is reminded to pray for these two women who are so deeply drawn into spiritual deception. The other issue here is not Oprah's right to present her New Age views - but to be honest with her viewers and listeners about these beliefs. For over twenty years Oprah has been taking her viewers and listeners step-by-step deeper into the New Age teachings. It is time for her to stop pretending that her New Age "Jesus" is the same as the Jesus of her Baptist youth. The "Jesus" of A Course in Miracles and the "Jesus" of the New Age bear absolutely no resemblance to the Jesus found in the Holy Bible. It seems apparent that in early November someone calculated that the time was right for Marianne Williamson to teach the year-long, 365 lessons of A Course in Miracles on Oprah & Friends XM Satellite Radio. But one has to wonder if this situation, like the one described by Neale Donald Walsch above, was "just too soon" and too "way ahead of the curve" in teaching the year-long Course at this time. What difference does it make whether Marianne Williamson is "teaching" A Course in Miracles directly, or "teaching" it indirectly by providing "reflections" on it? Whatever the case, whether through "reflection" or "teaching," this year-long study of the Course, designed for listener participation, will lead many deeper into spiritual darkness. Footnote * Humanity’s Team Leadership Gathering, Portland, Oregon, June 27- July 1, 2003: “The Care and Feeding of the Press.” Transcribed from audiotape by Warren Smith and cited in the second edition of Reinventing Jesus Christ: The New Gospel, Chapter 3 Update, subsection heading "Walsch, Winfrey and the Press." New Age deception like this is extremely serious, leading potentially millions of people astray and into the very pit of the Abyss. Furthermore, the fact that such spiritual deception is now occurring on the extremely popular Oprah Winfrey Show and Radio, is proof positive that the world is getting so close to the actual appearance of Antichrist that the Global Elite has decided to "multiply" the message of Antichrist deception with Oprah! People like these following the New Age principles on the Oprah Winfrey Show are prime candidates to receive God's dreaded "strong delusion" once Antichrist has arisen, a deception designed to cement them in their deception, so they cannot see the Truth and be saved. Truly, the End of the Age is coming upon mankind quickly.